As I was busy with some other activities I couldn't get you some updates last month. 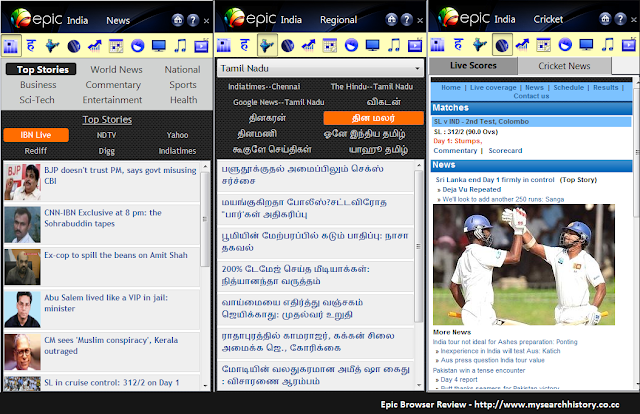 Here I would like to introduce first ever Indian Web Browser powered by Mozilla. Meet Epic Your New Best Friend. So I just wanted to give it a try as I am always curious on testing features of different browser. The best part is It's free and just 11 MB in size. I would bring you a review about the browser. 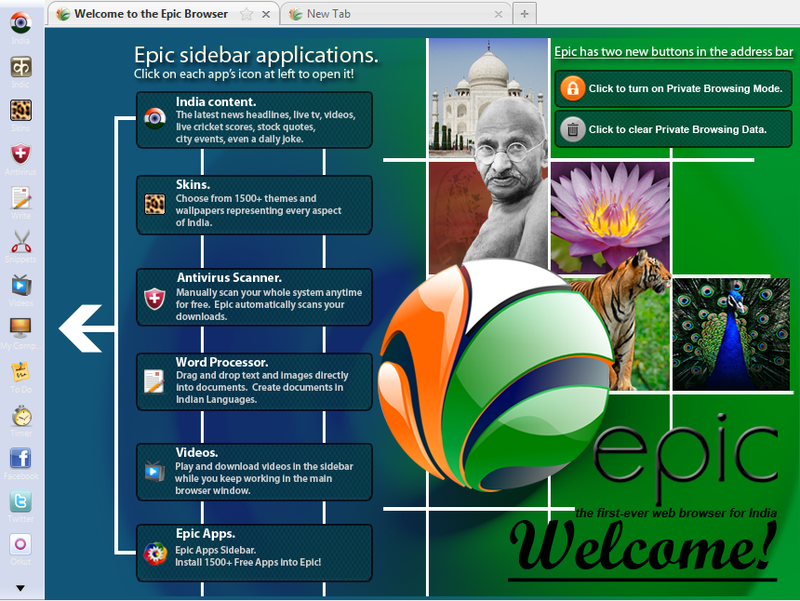 As Epic is developed from Mozilla Firefox which is open-source based and completely free to use/distribute, Epic has more customized features for Indian internet users along with the default Firefox features. To begin my review, it is very easy to install and use Epic on your system, and enjoy its features. I would discuss more about Epic in the following sections. 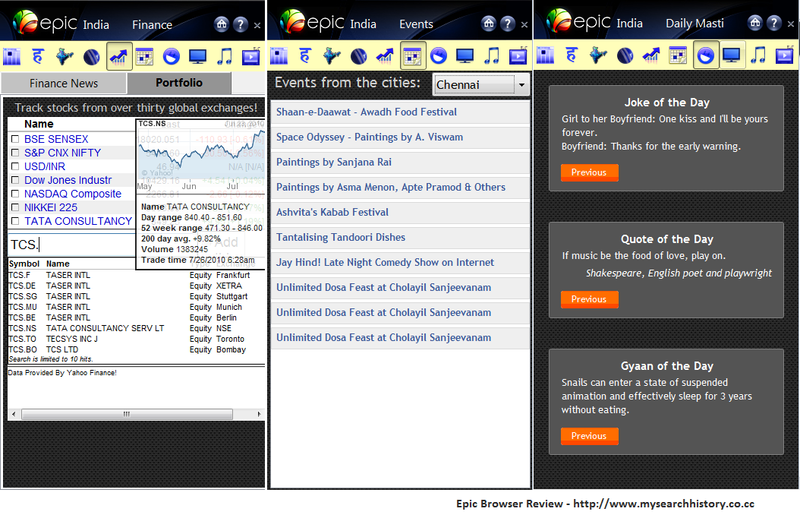 The bowser looks different comparing to other browsers and is like cross of firefox with Google Chrome. All browser components float over a single image which can be changeable called Skin. These skins are especially of Indian sceneries and celebrities - a plus point. However the default things of Firefox like Menu, Search bar, Address bar all are same, except few modifications to icons. This is one of the best features every Indian will like. It has many apps that will get us variety of stuff from web to single place, to our browser. The very first app is India, lets you choose topics among News, Hindi, Regional, Cricket, Finance, Events, Daily Masti, Live TV, Music, and Videos. All are favorite stuff of Indians. Each of above services are provided by specific partners of Epic like web18, in.com, yatra.com, NDTV etc. It is like a small text editor for Indic languages: Hindi, Tamil, Telugu, Arabic etc. We can save typed text or copy to Epic write (another useful Side app) straightaway. Enabling 'Indic Dropdown in texboxes' will let us to type in selected Indic language in texboxes in any pages. Skins let us to dress up Epic with thousands of free wallpapers, backgrounds and themes. We can edit the theme straightaway from the browser also. Epic ensures secure browsing with its built-in Antivirus app, powered by ESET Antivirus and WOT (Web Of Trust). It allows to scan the entire system, selected folders or directories, and downloads. It scans for fraudulent links and webpages when we are browsing. It highlights secure pages and sites as well as the copycats sites or phising sites at a first glance on addressbar. It is a word processor app for editing contents in English and Indic languages. 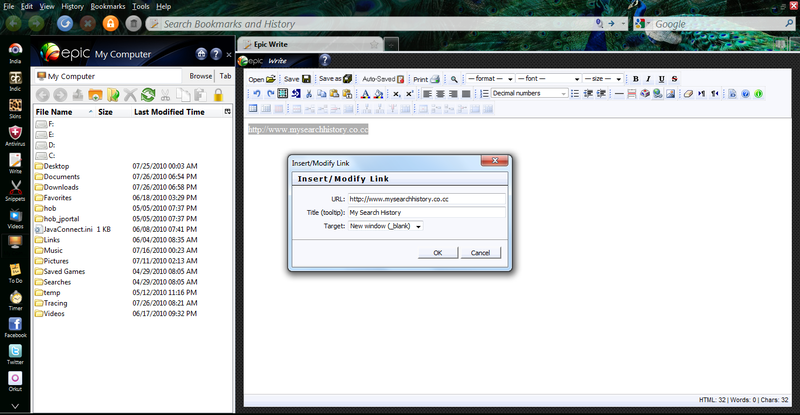 It can even open our local files for editing and can save to local machine. It is enriched with variety of controls that make our editing better. It is based on the Scrapbook addon of Firefox. It is now much easier to create a web snippet with the contents like text, graphic, images on any web pages. Built-in video search engine and player makes us to feel happy with faster video search from YouTube and playback them with playlist feature. Browse the local drives and files of our computer and make use of them into Epic. It is a perfect File Explorer. Addon to your regular activities when browsing. Connect with social networking sites like Orkut, Facebook, Twitter, Yahoo easier than ever. Instantly search maps, get directions by walk, road, railway. This app is powered by Google Maps widget. Powered by yatra.com. Book domestic or international air tickets straight from this app. Search for jobs and openings world wide using this small app. Play online games straightaway from your browser. Keep our files online for sharing. Simple file manager powered with GMail services, all files are backed-up to our Gmail account so that they can be accessed anywhere if we are connected with internet. Store and Open your favorite website collections in a single click and save time spent on searching and hitting addresses one by one. A place where search and access for thousands of Free Epic apps classified for our interests. Epic provides faster, safer and secure, easier browsing over web with its amazing sidebar apps and features even in its first release. I am sure Epic is going to make a revolution in the browser history, wishes from mysearchhistory. My hearty congratulations and wishes to the development team and for all their future inventions. 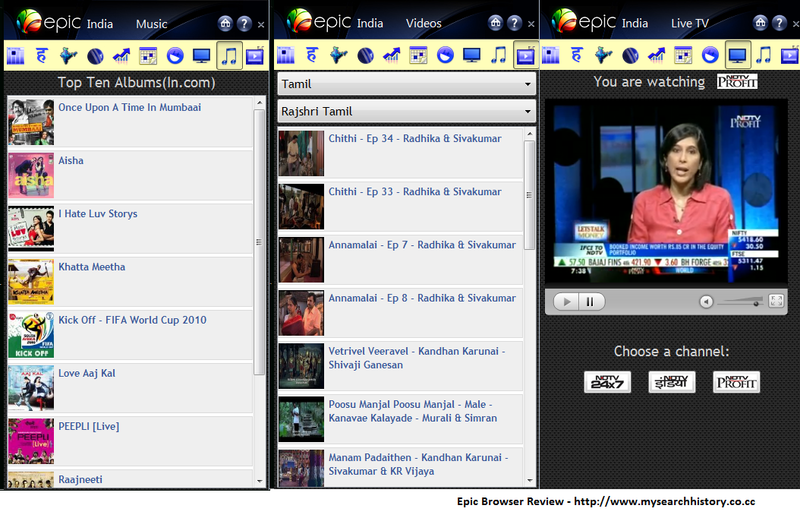 As an Indian, any one can proudly say "Epic is not only built for Indians, for the entire world". So why is the wait? Start enjoying better browsing with Epic. Please post your comments about this review.